About two weeks ago, one of my daughters and my two sons began mentioning this idea of theirs to open a restaurant. Now, given the fact that this particular daughter is 9 years old and her brothers only 7 and 4, I was naturally curious as to how this plan would proceed. Apparently, this was to be a roadside restaurant, sort of in a lemonade-stand design: People would drive by, see the sign, and then, hopefully, stop and order something. Just to give you a mental picture of the “town” we live in, it’s called Coldwater. Doesn’t exactly imply a thriving metropolis, does it? Also, considering we actually live approximately a mile off the nearest main highway, the likelihood of much traffic in our neck of the woods is fairly slim. The enthusiasm was so high between the three of them, though, I decided my best course of response to whatever they told me they were going to do would be to smile and nod affirmatively, as long as it didn’t have anything to do with power tools, the killing of animals, or a start-up cash loan. 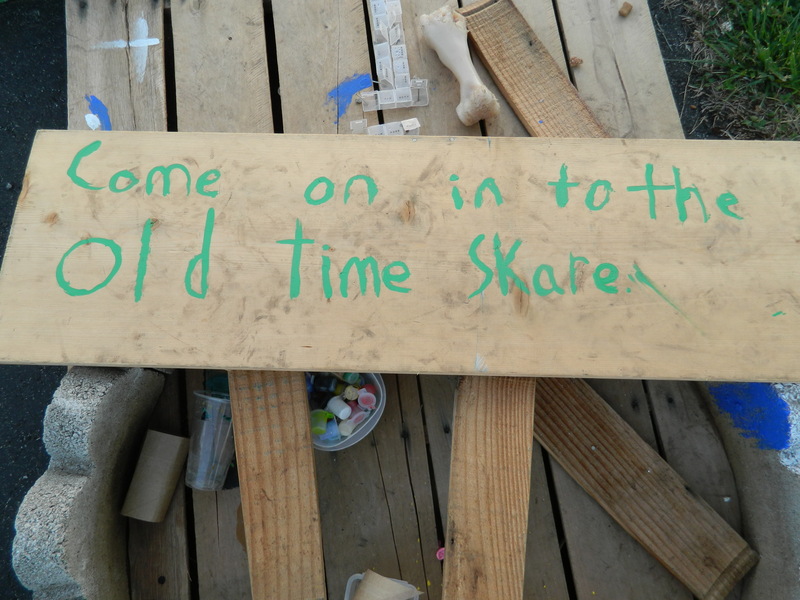 Of course, the 4-year-old lost attention fairly quickly once the other two actually began to actually hammer bits of wood together for signs, but the other two stuck with it. Soon, I came home to discover, sitting in the yard, a couple of kids’ lawn chairs, a wooden pallet, some assorted cinder blocks, and painted wooden signs advertising the new establishment. Granted, they still hadn’t solved the dilemma of not having any actual food for their restaurant, but problems of this nature are relatively minor to aspiring elementary school-aged entrepreneurs. No one actually stopped at the new roadside attraction the first day, but I was told there were some curious looks and plenty of smiles from those who drove by. They were proud of their work, and I was proud of them for putting the time in, even if I knew there wasn’t much way they could succeed. That night, as the sun was setting and my daughter and I were heading inside, I noticed one of the signs had a strange word written on it – skare – so I asked her what it meant. And then, my daughter laughed, said, “Oh, well,” and went on inside our house. I just stood there, dumbfounded. Even at 9 years old, I would have been absolutely mortified if someone had pointed out one of my mistakes like that. I would have been completely distraught at the fact that people had driven by all day looking at it. And I would have worked until the daylight was gone trying to fix what I had done wrong. And my daughter just said, “Oh, well…“, and didn’t give it another thought. Now, this particular incident has caused me to reach two very distinct and different possible conclusions: Either I have taught my daughter that it is okay to make a mistake and that she needn’t beat herself up if she gets something wrong or I have not taught my daughter to strive for perfection and she does not care enough about doing a good job. The former of these, I can live with; the latter … eh, not so much. In fact, that would be something I would want to rectify immediately. Therein lies the rub, though, so to speak. I have struggled with perfectionism for as long as I can remember, and I certainly don’t want my children to grow up afraid to try different things because they might get something wrong. On the other hand, by virtue of them being my children, I have a burning compulsion for them to be the best possible human beings they can be. So I don’t want them to settle for “Oh, well…“, but I also don’t want them belittling themselves constantly and killing their self esteem. I suppose there is the possibility here that God is trying to teach me through my daughter to learn how to move on from mistakes and not worry so much. I also suppose the possibility exists that this is a wake-up call to me to teach and preach a better work ethic to my children. The actual answer probably lies somewhere in between, and, unfortunately, finding it will be a largely imperfect process.